How many readers are celebrating Black History Month through February? I've had a few question why I bother highlighting Black History and not because they thougth it was a waste of time but because they figured by this time black history and white history should have easily merged. Maybe this is true but sadly, not much history is taught at all at the elementary level. That and I love enlightening students with what our country was like during slavery and the Civil Rights movement. I think they should know about Harriet Tubman, Sojourner Truth, George Washington Carver (the list goes on), as historical figures so they can go beyond their knowledge of Rosa Parks and Dr. King-great people to know-but there is more to understand. We study it because it is the human history of our country. I want my elementary students heading to middle school with a clear idea of what the Underground Railroad was; a path to freedom not an actual train that runs below ground. Uhh, yes, many think just that. Lord. My 3 featured read-aloud books this week emphasize the Underground Railroad. The Patchwork Path; A Quilt Map to Freedom by Bettye Stroud, illustrated by Erin Susanne Bennett (2005). 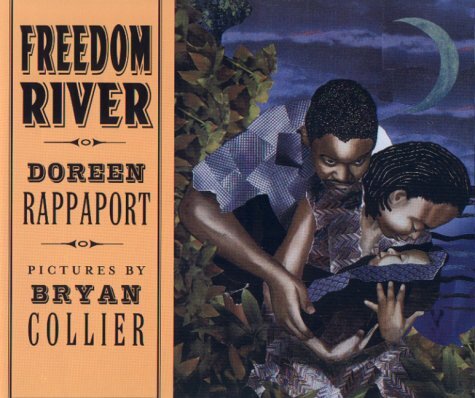 Friend on Freedom River by Gloria Whelen, illustrated by Gijsbert van Frankenhuzen (2004). Show Way by Jacqueline Woodson; illustrated by Hudson Talbott (2005). What are you reading this week? Does your school celebrate Black History Month?